June 25, 2004 – NEW YORK (Reuters Health) – Diets rich in Curcumin–a compound found in the curry spice turmeric–may help explain why rates of Alzheimer’s disease are much lower among the elderly in India compared with their Western peers. Alzheimer’s disease is characterized by the buildup of amyloid protein “plaques” within the brain. In studies in rats, Curcumin “not only reduces the amyloid, but also reduces the (brain’s) response to the amyloid,” according to researcher Dr. Sally Frautschy of the University of California, Los Angeles. She presented her findings Thursday at the annual meeting of the Society for Neuroscience in San Diego, California. Previous studies have noted that elderly individuals living in Indian villages appear to have the lowest incidence of Alzheimer’s disease in the world, with just 1% of those aged 65 and older contracting the degenerative brain condition. The reasons for this low incidence remain unclear, however. Frautschy speculated that Curcumin found in curry could provide a clue to this puzzle since the compound has “a long history of dietary and herbal medicinal use” and is also a powerful antioxidant and anti-inflammatory agent. In her study, Frautschy fed middle-aged (9 months old) and aged (22 months old) rats diets rich in Curcumin. All of the rats had received brain injections of amyloid to mimic progressive Alzheimer’s disease. “Curcumin reduced the accumulation of beta-amyloid and the associated loss of proteins” in the synapses, or gaps, between individual brain cells, Frautschy reported. “Synapses connect nerve cells and are crucial for memory,” the California researcher explained. Keeping synapses free of plaque is important because “their loss correlates well with memory decline in Alzheimer’s.” This type of memory preservation may have been reflected in the fact that rats fed curcumin also performed much better in memory-dependent maze tests compared with rats on normal diets, according to Frautschy. Curcumin also appeared to reduce Alzheimer’s-related inflammation in neurologic tissue. Because “a combined anti-inflammatory and antioxidant approach will be useful for Alzheimer’s prevention or treatment,” Frautschy speculates that Curcumin could be especially valuable in the fight against the disease, especially in combination with anti-inflammatory drugs like ibuprofen. Her team is hopeful they will soon receive funding for clinical trials to investigate curcumin-ibuprofen combination therapy. The Curry Spice Curcumin Reduces Oxidative Damage and Amyloid Pathology in an Alzheimer Transgenic Mouse. Lim GP, Chu T, Yang F, Beech W, Frautschy SA, Cole GM. Departments of Medicine and Neurology, University of California, Los Angeles, Los Angeles, California 90095, and Greater Los Angeles Veterans Affairs Healthcare System, Geriatric Research, Education and Clinical Center, Sepulveda, California 91343. Inflammation in Alzheimer’s disease (AD) patients is characterized by increased cytokines and activated microglia. Epidemiological studies suggest reduced AD risk associates with long-term use of nonsteroidal anti-inflammatory drugs (NSAIDs). Whereas chronic ibuprofen suppressed inflammation and plaque-related pathology in an Alzheimer transgenic APPSw mouse model (Tg2576), excessive use of NSAIDs targeting cyclooxygenase I can cause gastrointestinal, liver, and renal toxicity. 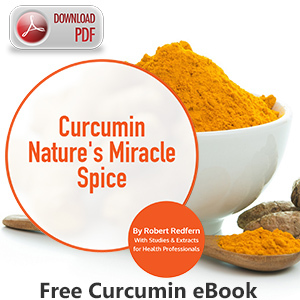 One alternative NSAID is curcumin, derived from the curry spice turmeric. Curcumin has an extensive history as a food additive and herbal medicine in India and is also a potent polyphenolic antioxidant. To evaluate whether it could affect Alzheimer-like pathology in the APPSw mice, we tested a low (160 ppm) and a high dose of dietary curcumin (5000 ppm) on inflammation, oxidative damage, and plaque pathology. Low and high doses of curcumin significantly lowered oxidized proteins and interleukin-1beta, a proinflammatory cytokine elevated in the brains of these mice. With low-dose but not high-dose curcumin treatment, the astrocytic marker GFAP was reduced, and insoluble beta-amyloid (Abeta), soluble Abeta, and plaque burden were significantly decreased by 43-50%. However, levels of amyloid precursor (APP) in the membrane fraction were not reduced. Microgliosis was also suppressed in neuronal layers but not adjacent to plaques. In view of its efficacy and apparent low toxicity, this Indian spice component shows promise for the prevention of Alzheimer’s disease.